A VW plant in Mexico has caused controversy by blasting hail cannons at the sky in an attempt to stop hail from smashing their valuable car inventory. Farmers say the cannons are causing a drought that’s wrecking crops. There’s a surprisingly long history of hail cannons – humans have tried to stop ice from falling from the sky for at least hundreds of years. No one has any idea whether hail cannons work. Hailstorms can be terrifying and expensive. Suddenly, balls of ice start falling out of the sky with enough force to smash cars and vineyards, causing serious injury or death to anyone unlucky enough to be caught outside. An attempt to control these storms is causing controversy, despite questions about whether it’s possible to prevent hail in the first place. A Volkswagen plant in Puebla, Mexico, has incurred the wrath of nearby farmers who say that by firing “hail cannons,” which blast shockwaves into the sky to theoretically prevent hail from forming, the automaker is causing a drought. The AFP reports that farmers believe the cannons have prevented any precipitation from falling since May, during the rainy season. The farmers are now seeking almost $US3.7 million in compensation for at least 5,000 acres of affected crops. When the cannons are fired, “the sky literally clears and it simply doesn’t rain,” Gerardo Perez, a farmer leading protests, told AFP. In response, Volkswagen reportedly has said it will install mesh netting to protect the cars, and turn off the mechanism that causes the cannons to auto-fire under certain weather conditions. “Once the anti-hail nets are installed in the yards, they will be used as the main measure for the protection of vehicles, while the devices will serve as a secondary tool and will only be used in manual mode,” a VW spokesperson told the Financial Times. But even manual use is unacceptable, local environmental official Rafael Ramirez told AFP. “The company can take other measures to protect its cars, but people here can’t live off anything but their land,” he said. 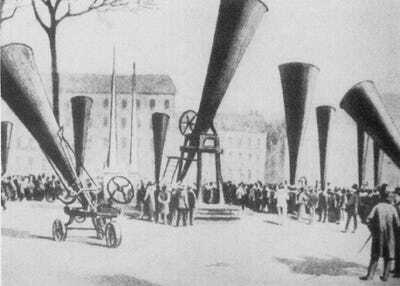 Plumandon/Wikimedia Commons/Public DomainA 1901 image of a hail cannon meeting. According to the FT, the German automaker installed the cannons earlier this year. Even though these particular hail cannons are new, the idea of preventing hail by preemptively shooting it out of the sky first is not. By 1896, new types of hail-cannons had been designed, according to a paper published in the Bulletin of the American Meteorological Society (and spotted in a history of hail cannons published in Atlas Obscura). These cannons were like mortars, firing large and loud smoke rings – the idea being that smoke particles might stop hail from forming. 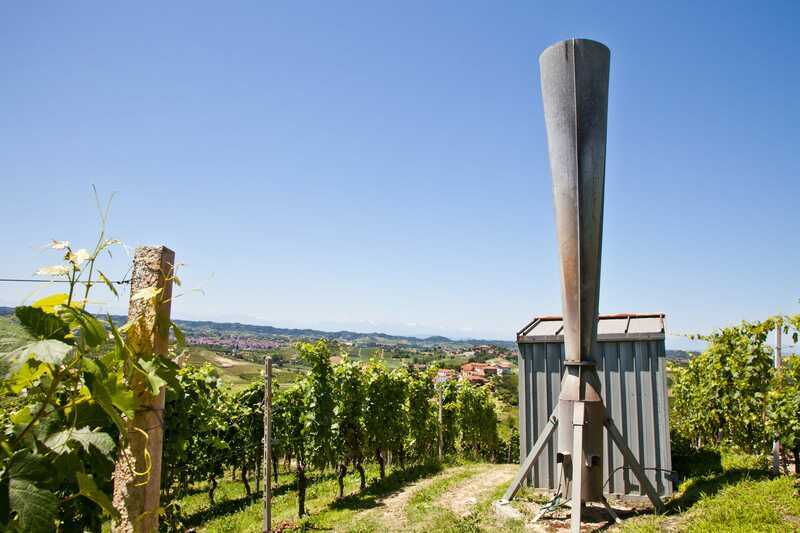 When these first cannons, designed by a winemaker, were tested during storms, it didn’t hail. The idea caught on, with winemakers throughout Europe trying to get a hold of the devices to protect valuable crops. There were 2,000 cannons operating in Italy by 1899. Storms would approach, cannons would be fired. Sometimes, it wouldn’t hail and cannons were praised. Other times, hail would fall, with the failure chalked up to operator error. Within a few years, these smoke cannons fell out of favour. No one could tell if they did anything. Instead of using smoke or projectiles, modern hail cannons – like those used at the Puebla Volkswagen plant – rely on loud shockwaves, fired repeatedly every few seconds as a storm approaches. As one New Zealand hail cannon manufacturer explains it, they fire a burst of explosive gas inside the cannon to generate the shockwave. “This shockwave, clearly audible as a large whistling sound, then travels at the speed of sound into & through the cloud formations above, disrupting the growth phase of the hailstones,” the manufacturer wrote. Winemakers and auto manufacturers make use of the cannons to try to protect their valuable goods. 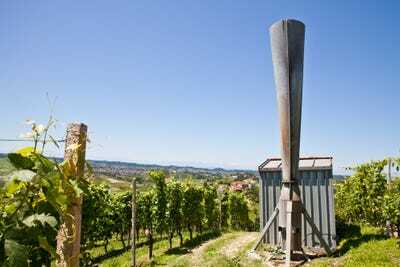 In 2007, a California NPR station reported that winemakers were using the cannons to try to prevent hail formation. In 2005, CNN reported that a Nissan plant in Mississippi upset neighbours by repeatedly blasting the loud cannons to break up hail. But still, no one knows if the cannons actually work. “Scientists say there is no way to prove if these cannons really work, but farmers say it is cheaper to try the cannons than to buy hail insurance,” reported NPR, in that story. Sceptics have also pointed out that like hail cannons, thunder produces loud shockwaves – but hail shows up anyway. Modifying weather isn’t theoretically impossible, but it has proven to be unpredictable and difficult to control. It’s unclear whether the VW cannons in Mexico can prevent hail or cause drought. Either way, it sounds like mesh netting to protect the cars might be a safer option.